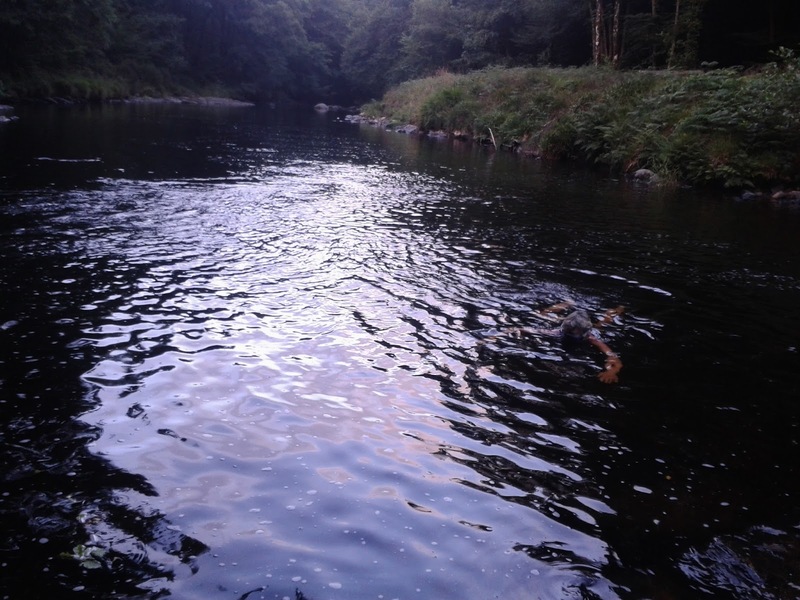 During the heatwave we've taken to swimming in the Dart pretty much every evening, and even though the temperatures have fallen and the rain has come, the lovely habit persists. After all, if you live just a couple of miles from the Dart why not take daily advantage? 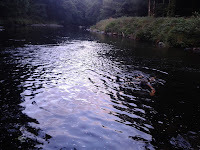 Today was particularly sweaty and sticky, and Rachel and I went down to a broad pool by Buckland Bridge. The River Webburn bubbles into the pool, sending swirls of foamy blobs downstream. We swam up against the current, watching fish jump, before turning and floating downstream. Suddenly, ouch! We hit the cold confluence of the two rivers. You have to walk through a caravan park to get to Row Cove. It's full of green static vans lovingly maintained by their owners, who tend to be locals from Plymouth. Some - the caravans not the owners - even have roses trained around the door. A staircase takes you down to the beach, where an intriguing map of sea and rocks spreads out before you. (On the way down we met a two chaps on their way back with a huge lobster; they were puffing with exhaustion having had to row out to their pot because their outboard had given up the ghost. Perhaps that's why it's called Row Cove? I digress). There's a whole network of gullies, channels and even a small rock arch to explore. The water was incredibly clear; we could see the bottom, and spent ages pottering about, diving off rocks and getting lost in the maze.